taire Vaudois and University of Lausanne, Lausa nne, Switzerland. 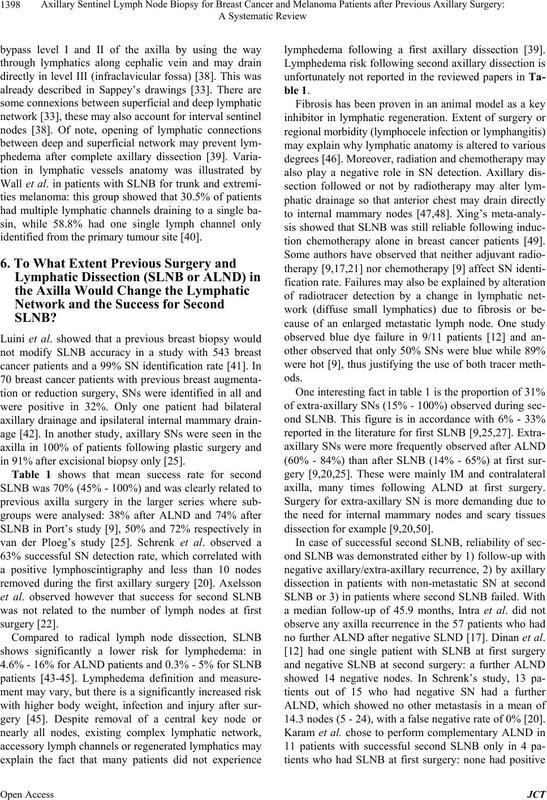 be taken with caution because of the heterogeneity of publications regarding SLNB and surgical technique. plasm in women with an incidence of about 15/100,000. skin second primary cancer in melanoma patients . 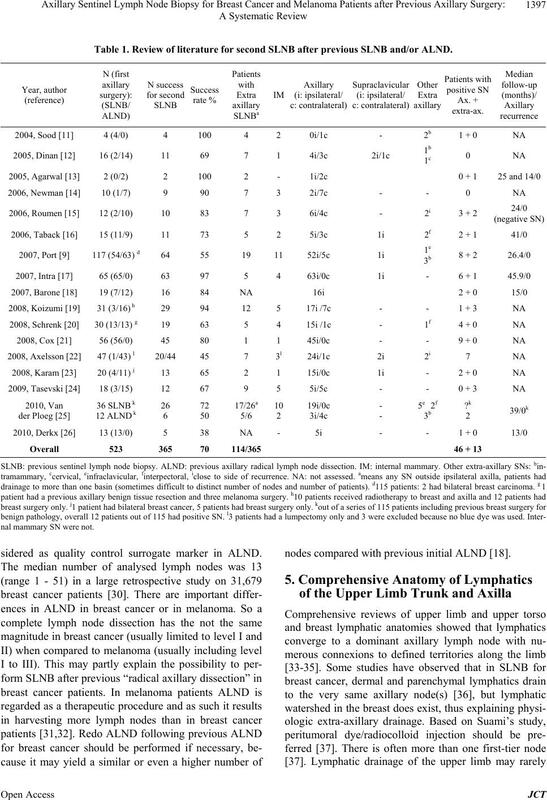 following radical axillary lymph node dissection (ALND). for recurrent ipsilateral breast cancer were feasible . col for the SN anatomopathological examination. follow-up period ranging from 15 to 46 months. tic dissection in the same regional lymphatic network. where drainage is frequently unpredictable . 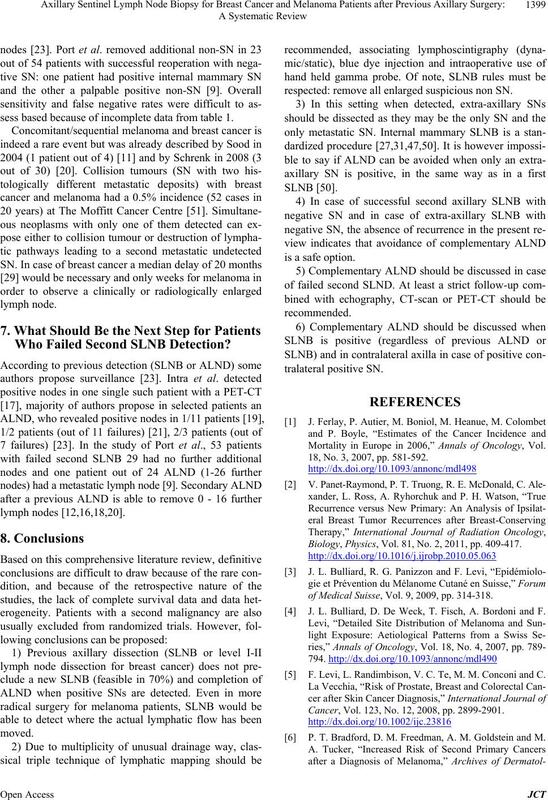 firm oncological value of second SLNB, among others. 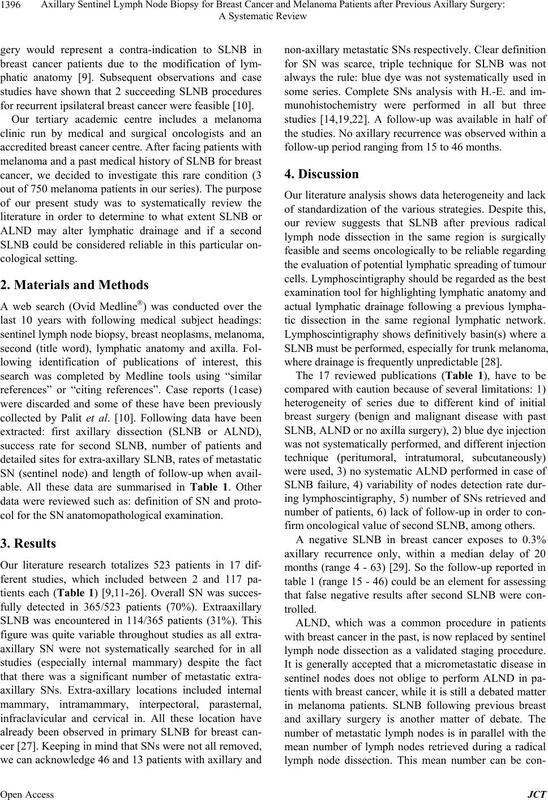 lymph node dissection as a validated staging procedure. 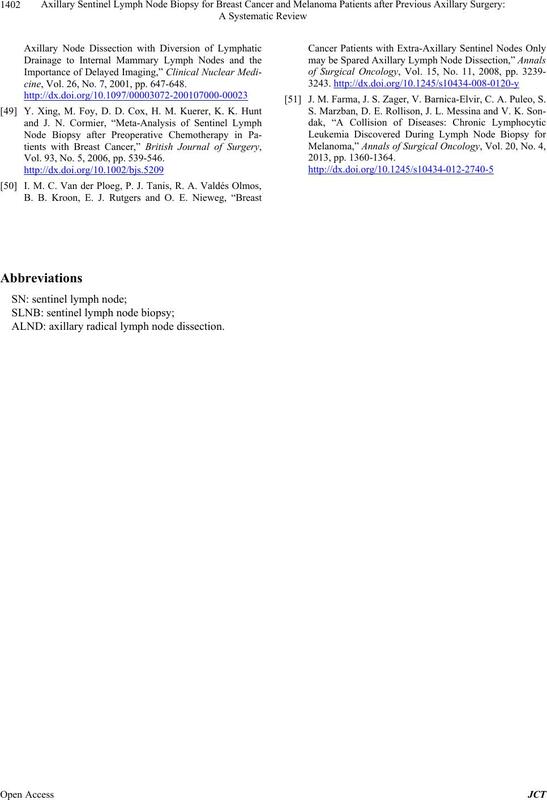 Table 1. Review of literature for second SLNB after previous SLNB and/or ALND. nal mammary SN were not. sidered as quality control surrogate marker in ALND. nodes compared with prev ious initial ALND . identified from the primary tumour site . in 91% after excisional biopsy only . lymphedema following a first axillary dissection . tion chemotherapy alone in breast cancer patients . axilla, many times following ALND at first surgery. no further ALND after negative SLND . Dinan et al. 14.3 nodes (5 - 24), with a false negative rate of 0% . sess based because of incomplete data from table 1.
Who Failed Second SLNB Detection? respected: remove all enlarged su spicious non SN. Mortality in Europe in 2006,” Annals of Oncology, Vol. 18, No. 3, 2007, pp. 581-592. Biology, Physics, Vol. 81, No. 2, 2011, pp. 409-417.
of Medical Suisse, Vol. 9, 2009, pp. 314-318. J. L. Bulliard, D. De Weck, T. Fisch, A. Bordoni and F.
 F. Levi, L. Randimbison, V. C. Te, M. M. Conconi and C.
Cancer, Vol. 123, No. 12, 2008, pp. 2899-2901. P. T. Bradford, D. M. Freedman, A. M. Goldstein and M.
ogy, Vol. 146, No. 3, 2010, pp. 265-272. Breast Cancer Research, Vol. 9, No. 1, 2007, p. R10. M. R. Bower, C. R. Scoggins, R. C. Martin 2nd, M. P.
Mays, M. J. Edwards, D. S. Reintgen, M. I. Ross, M. M.
Urist, R. D. Noyes, J. J. Sussman, L. J. Hagendoorn, A. J.
of Surgery, Vol. 76, No. 7, 2010, pp. 675-681. Oncology, Vol. 14, No. 8, 2007, pp. 2209-2214. Vol. 29, No. 6, 2008, pp. 565-567. A. Sood, I. M. Youssef, S. I. Heiba, H. El-Zeftawy, D.
Clinical Nuclear Medicine, Vol. 29, No. 11, 2004, pp. Vol. 190, No. 4, 2005, pp. 614-617.
ogy, Vol. 92, No. 1, 2005, pp. 4-8.
gical Oncology, Vol. 32, No. 10, 2006, pp. 1076-1081. 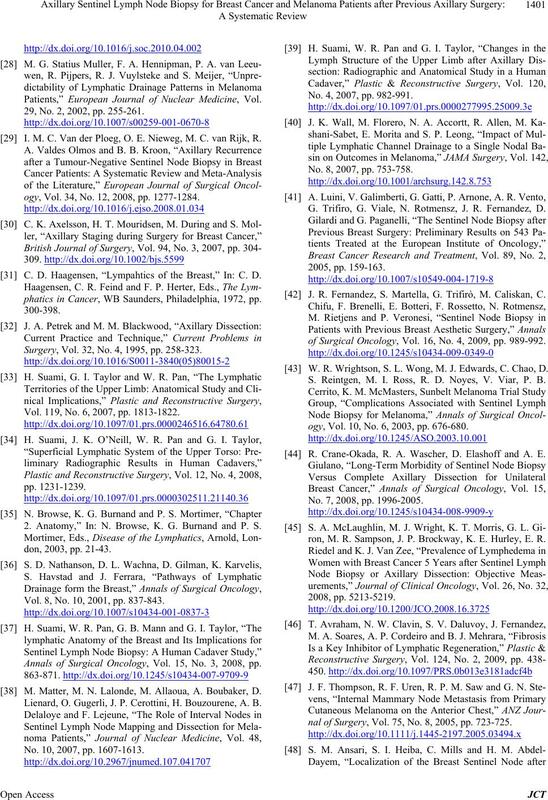 B. Taback, P. Nguyen, N. Hansen, G. K. Edwards, K.
Conserving Therapy,” Annals of Surgical Oncology, Vol. 13, No. 8, 2006, pp. 1099-1104. 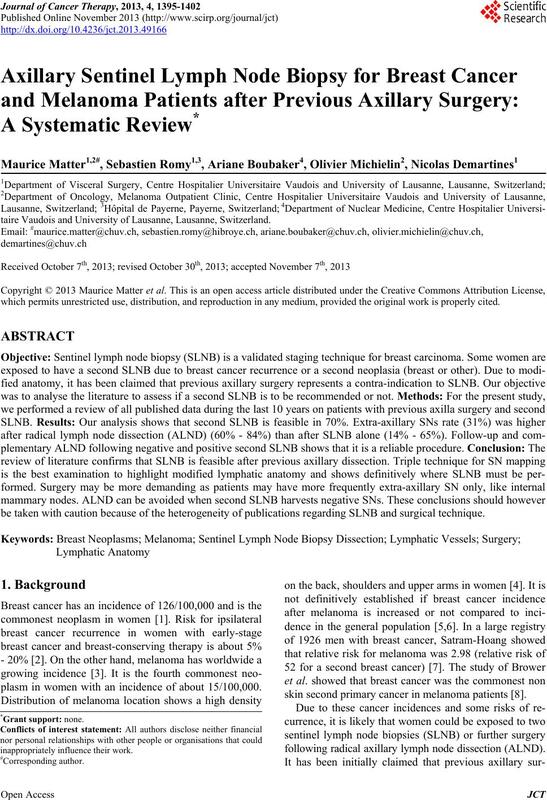 Journal of Surgery, Vol. 94, No. 10, 2007, pp. 1216-1219. J. L. Barone, S. M. Feldman, A. Estabrook, P. I. Tartter, S.
gery, Vol. 194, No. 4, 2007, pp. 491-493. M. Koizumi, M. Koyama, K. Tada, S. Nishimura, Y.
Miyagi, M. Makita, M. Yoshimoto, T. Iwase, R. Horii, F.
of Surgical Oncology, Vol. 34, No. 8, 2008, pp. 851-856.
of Surgeons, Vol. 207, No. 1, 2008, pp. 57-61.
geons, Vol. 207, No. 4, 2008, pp. 543-548. Relapse,” Breast, Vol. 18, No. 5, 2009, pp. 322-326. Vol. 17, No. 4, 2010, pp. 1069-1075.
gen, G. A. Nieuwenhuijzen, L. V. van de Poll-Franse, R.
gical Oncology, Vol. 36, No. 7, 2010, pp. 646-651. Vol. 19, No. 3, 2010, pp. 507-517. Patients,” European Journal of Nuclear Medicine, Vol. 29, No. 2, 2002, pp. 255-261. I. M. C. Van der Ploeg, O. E. Nieweg, M. C. van Rijk, R.
ogy, Vol. 34, No. 12, 2008, pp. 1277-1284. C. D. Haagensen, “Lympahtics of the Breast,” In: C. D.
phatics in Cancer, WB Saunders, Philadelphia, 1972, pp. Surgery, Vol. 32, No. 4, 1995, pp. 258-323. Vol. 119, No. 6, 2007, pp. 1813-1822. 2. Anatomy,” In: N. Browse, K. G. Burnand and P. S.
Vol. 8, No. 10, 2001, pp. 837-843. 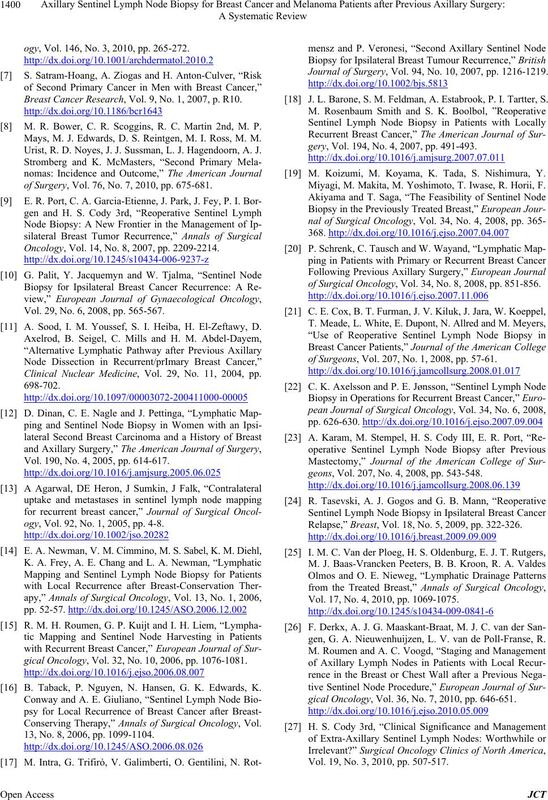 Annals of Surgical Oncology, Vol. 15, No. 3, 2008, pp. M. Matter, M. N. Lalonde, M. Allaoua, A. Boubaker, D.
Lienard, O. Gugerli, J. P. Cerottini, H. Bouzourene, A. B. No. 10, 2007, pp. 1607-1613. No. 4, 2007, pp. 982-991. No. 8, 2007, pp. 753-758. G. Trifiro, G. Viale, N. Rotmensz, J. R. Fernandez, D.
 J. R. Fernandez, S. Martella, G. Trifirò, M. Caliskan, C.
of Surgical Oncology, Vol. 16, No. 4, 2009, pp. 989-992. W. R. Wrightson, S. L. Wong, M. J. Edwards, C. Chao, D.
S. Reintgen, M. I. Ross, R. D. Noyes, V. Viar, P. B.
ogy, Vol. 10, No. 6, 2003, pp. 676-680. R. Crane-Okada, R. A. Wascher, D. Elashoff and A. E.
No. 7, 2008, pp. 1996-2005.
ron, M. R. Sampson, J. P. Brockway, K. E. Hurley, E. R.
nal of Surgery, Vol. 75, No. 8, 2005, pp. 723-725.
cine, Vol. 26, No. 7, 2001, pp. 647-648. Vol. 93, No. 5, 2006, pp. 539-546. J. M. Farma, J. S. Zager, V. Barnica-Elvir, C. A. Puleo, S.
ALND: axillary radical lymph node dissection.